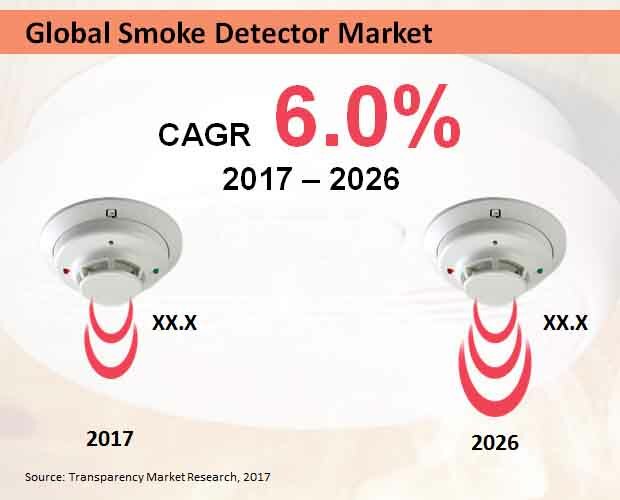 The global smoke detector market is expected to experience moderate growth in coming years due to the presence of multiple players in the market, according to the Transparency Market Research (TMR). The smoke detector market consists of system integrators and product manufactures. The players in the market are utilizing technological developments to provide better and advanced smoke detector systems for the users. These players are also getting into strategic alliances and collaborations to increase their dominance in the global smoke detector market. Some of the key players in the smoke detector market include Hochiki Corporation, United Technologies Corporation, NEC Corporation, Tyco, Siemens AG, Johnson Control, Robert Bosch, Nest labs, Schneider Electric, Johnson Control, and Honeywell International. According to the TMR analysis, the global smoke detector market is expected to reach a valuation of US$ 2.1 bn during the forecast period 2017 to 2026. The market is projected to expand at a CAGR of 6.0% during this forecast period. As per the report, the demand is likely to remain higher in the residential segment during the forecast tenure than the industrial segment. Increasing concerns to ensure better safety and security from fire in homes has led this segment to lead the market. Geographically, Europe is leading the global smoke detector market, and is anticipated to reach a valuation of US$ 0.7 bn during the forecast period. Emerging economies in Asia Pacific Excluding Japan (APEJ) is also termed as a lucrative market for smoke detector systems. The smoke detector market is growing due to increasing incidences of people getting injured because of accidental fire. Commercial buildings and residential setups are more susceptible to be damaged by fire. Thus, to prevent such incidents from happening, smoke detectors systems are being used at an increasing rate. During an emergency, these smoke detectors detect the smoke and ring alarms throughout the premises. The alarms signal people to evacuate the building. Smoke detectors also notify people in the surrounding areas and help in avoiding further damage. Furthermore, the compact structure of newly constructed buildings with multiple stories has created a dire need for installation of smoke detectors. Therefore, the presence of smoke detectors and rescue areas in any commercial or residential setup has now become a necessity. On the contrary, few factors may hamper the growth of the smoke detector market in coming years. One of the major factors is the high installation cost involved. The replacement of a conventional smoke detector with a modern smoke detector also proves to be very expensive. The customers usually refrain switching from the already installed smoke alarm to a modern smoke detector. Thus, the increase in the combined cost of using new smoke detectors becomes a deterrent to the growth of the market. To address such issues, the players of the smoke detector market are coming up with retrofitting solutions. These are easy to install and cost much lesser, thereby encouraging the customers to opt for modern smoke detectors.